Get Zen Tranquility CBD Capsules provides relief from pain. Get Zen is established on the belief that there is a relationship between cannabis and human chemistry. This synergy between cannabis and the human endocannabinoid receptors has been demonstrated in many ways. Being the most widespread receptor system in the human body, it can be explained why cannabis has so many different effects. 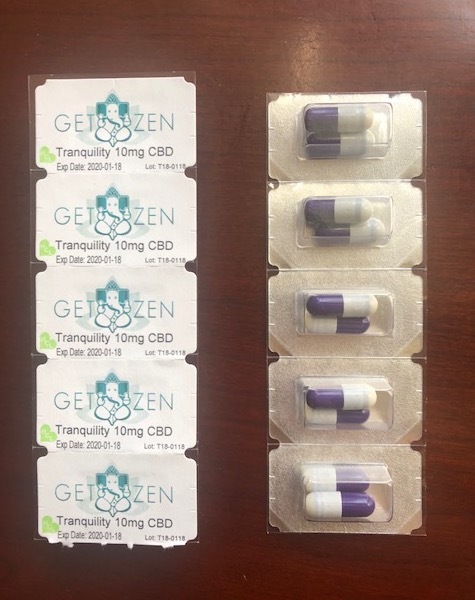 Get Zen takes a clinical approach to healthcare by trying to understand symptoms and treat the pain and other ailments utilizing Cannabinoids in conjunction with traditional healthcare practices. The team works with years of knowledge and experience, dedicating themselves to educate patients and the general public about the health benefits of their products. Tranquility is made from 99.99% pure crystalline CBD, and it contains zero THC. It is completely non-psychoactive and the best option for people without a “head” for THC. CBD isolate proved to be a better option to full spectrum hemp oil because many feedbacks suggested that the patients were getting more desired results without the side effects caused by other cannabinoids that usually cause drowsiness and weakness. Medicinal Uses: Pain Relief, MS, Migraines, Seizure Disorders, Anti-Anxiety, Anti-Inflammatory, Auto-Immune Disorders, Mood Stabilizer, Anti-Nausea. Great capsule for pain relief! Powerful capsules. Throwing out the meds and replacing with CBD!!!!!!! Best medicine for removing pains!!!!!!! great! start to work firstlyyyyy!! Awesome! best for pain cleaning !!!!!!!!! !